Snow has always seemed like the most reverent of weather phenomena, at least when it falls gradually in gentle winds. Not only is nearly silent, but it muffles other sounds. And in a city, it glows too. Early Saturday morning I decided to take pictures of the storm blanketing Provo. I left my house around 3:30 am, then went back around 4 am and woke Laura up. We wandered around downtown until about 6 am. Every few minutes, we heard low pops and then saw huge falling tree limbs. At one point I tried, unsuccessfully, to help a guy push his car out of an ice patch. And when the snowflakes became large, they cast shadows in the street light, making the ground look fuzzy like TV static. Tree near 100 East and Center Street. A tree bent over by the snow. The Covey Center for the Arts. Benches in the plaza near the Utah Valley Convention Center. New bike rack. Center Street. Smith’s gas station. Freedom Blvd. Historic Southworth Hall. Center Street. Center Street, looking west near the Historic Courthouse. Plants at the Utah Valley Convention Center. Railing on the historic Carnegie Library. Los Hermanos restaurant. Center Street. Cafe seating at Enliten Bakery and Cafe. Center Street. Enliten Bakery and Cafe. Center Street. The Echo Theatre. 100 Block, University Ave. Corner of Center Street and 200 East. Corner of 100 East and 100 North. *As I’m sure is apparent, I’m not a professional photographer nor were these photos taken with professional equipment. They also haven’t been photoshopped. […] communities concerned about their tree canopy deal with its preservation through ordinances that prevent tree removal. Not to say that such ordinances are categorically wrong, mind you. Just that, by focusing mostly on trees at the tail end of their lives — the ones that get the most notice and inspire the greatest affection — they steal attention from what should be the greater goal. Doyon goes on to argue that preservation efforts are unnecessarily divisive. Instead, he suggests that communities should focus on replanting because replanting efforts add to the canopy and don’t drive a wedge between differing factions. Kaid Benfield also later pointed out that the focus shouldn’t be about preservation verses tree removal. Like Doyon, he emphasizes ongoing planting. An emphasis on replanting trees helps cities evolve without battles over tree preservation. These points are especially significant for a growing city like Provo because trees can sometimes provide indirect incentives to build sprawl; if no trees can be cut down the only place to build is in undeveloped land where there are either no trees or no tree preservationists. As I’ve recently advocated building more housing in Provo’s existing neighborhoods, for example, one of the most common objections I’ve heard is that doing so would require cutting down trees. But an ongoing emphasis on replanting — combined with gradual building — would mean ongoing replenishment of Provo’s significant tree canopy. That would open the door for more positive infill, along with more trees. 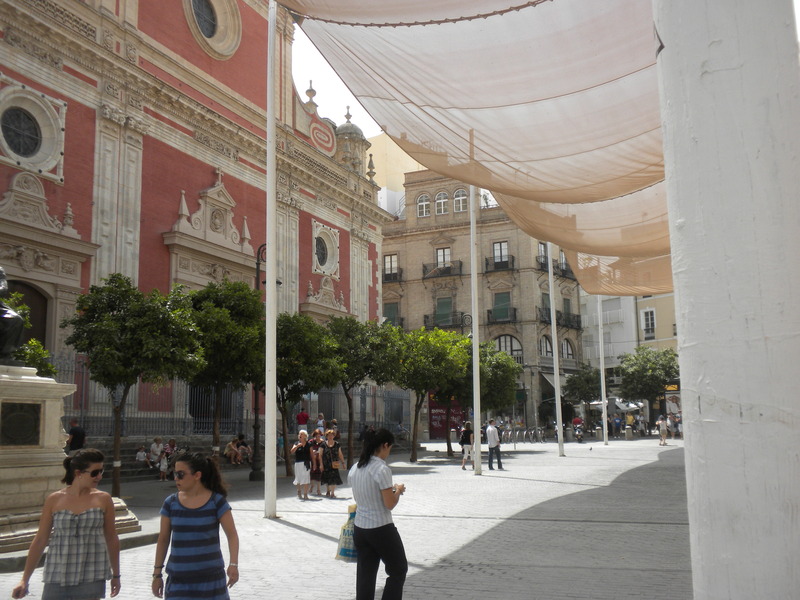 Cities that focus on replenishing their tree canopies will have the flexibility to handle growth — even if it means losing trees here and there. 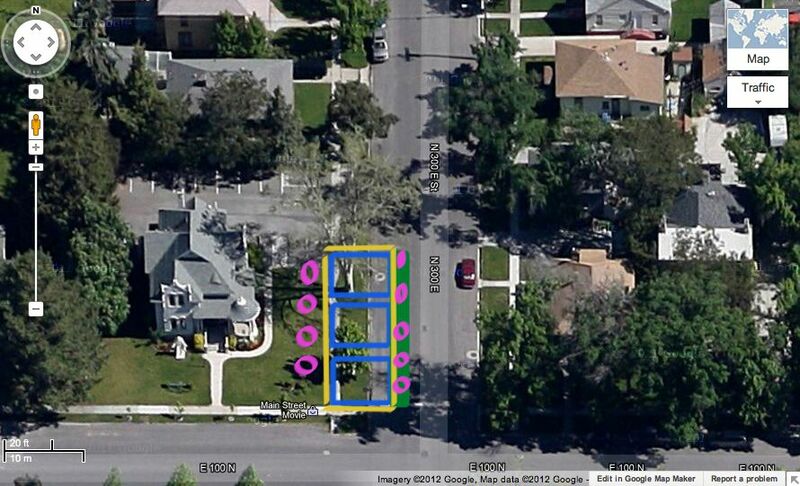 Earlier this week, I suggested that Provo sell off the edges of too-wide streets so they can be developed as housing. I stand by that idea because I think it would improve quality of life for everyone, because it would raise money, and because it would save millions in tax dollars. But I may not have articulated the idea very well. I’ve particularly begun to regret sharing that photo of the MOMA exhibit because while it took this concept to its logical conclusion, that isn’t a conclusion that could, or should, ever be reached. Instead, this idea is a way to reduce paved, expensive areas. If done right, it wouldn’t significantly reduce the amount of green space or the number of trees. Street space becomes housing in this picture. You’ll probably need to click on this picture to see much detail. The blue boxes represent possible lots for homes. They look small, but the house to the left is a mansion and one of the largest buildings in the neighborhood. I estimate that these “lots” — which, again, are crudely drawn — are about 20 feet deep and almost as wide. Depending on circumstance, they could also be made bigger. I’ve been casually researching small lot homes lately and I’ve found many incredible designs that would fit into these spaces. The yellow lines represent sidewalks. I’ve argued over and over that Provo needs to break up its huge blocks with more pedestrian paths. This idea wouldn’t exactly do that, but it would increase walkability by offering pedestrians multiple routes. The green strip to the right of the lots represents a new, grassy parkway. And finally, the purple circles represent trees (sorry, I had already used green). Note that this proposal would require cutting down two trees, but would result in planting nine new ones. In my book, that’s a major improvement. A few other things: with the exception of the trees, this entire proposal takes place on city land. The large lawn of the existing home is preserved and the reduction of green space is generally very minimal. This proposal also takes up less than half the street. Look at the car in the picture; the street is still wide enough for at least three, and maybe four, vehicles. However, with a narrowed street cars would tend to slow down, increasing safety. To that concern I say “so what?” Most of my favorite places in the world have irregular streets. The speed-related benefits of a narrower street would likely extend beyond the immediate vicinity of the new development, and if property owners up the block consented this concept could be extended. If they didn’t, the street could just stay narrower on one end. No big deal. And who knows, 200 years from now that irregularity might provide a spot for a nice little square or cafe like the one I recently saw in Tangier. Ultimately, irregularity is a benefit of this plan. This idea also doesn’t turn Provo into Manhattan or Europe. It simply replaces a bit of street with a few small homes and cottages for families. There’s still green space, trees, and full street access for existing homes. I’ve been wanting to write about this concept for months. I hesitated, however, because I wasn’t aware of a city that had actually tried it. But as my original post indicates, Vancouver is making it happen. The street grid in Vancouver is clearly different than the one in Provo, but this idea absolutely could be adapted and the picture above is just one possible way to do that. Urban food production is easy, cheap, and fun. A frequent topic on this blog (here, here and here, for example), it can provide healthy food for the community, particularly those who may not already have it. Moreover, cities like Provo already expend resources on community landscaping, meaning planting more fruit trees would be almost free. So why aren’t we growing more food in our parks and public spaces? Why isn’t urban fruit production a bigger part of the cultural and social environment in Utah? During morning runs he once took when living in Springville six years ago, Boddy began noticing how much fruit went unused and ended up rotting beneath the trees in his neighborhood. When he asked, the homeowners were more than happy to let him come and pick all he wanted for himself. Soon he was enjoying fresh grapes, apples, peaches and one year even gathered 50 pounds of cracked walnuts, all for free. Boddy also apparently uses his connections in the LDS Church to help distribute the produce he gleans. 1. It takes a community to supply the various skill sets needed to capitalize on urban fruit production. In other words, urban agriculture works best with a lot of people who share responsibilities and divide labor. 2. Utah communities already have the social structure in place to organize and divide labor to make urban agriculture more viable. That second point is especially significant. Provo in particular ranks highly for volunteerism, has strong religious and cultural ties, and can grow fruit. In that context, there’s no reason those factors shouldn’t converge into a social effort — however formal or not — to apply urban fruit production for the community good. It seems the only thing lacking is a catalyst. 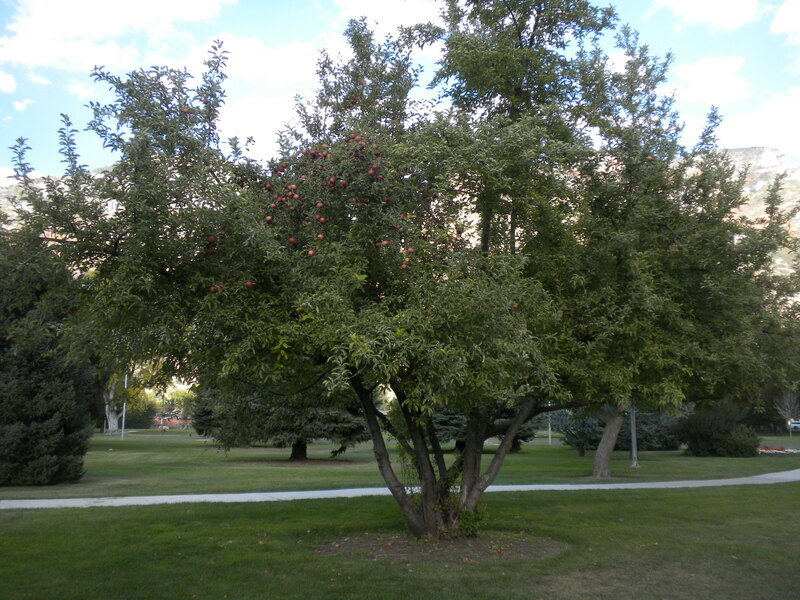 An apple tree in a Provo park. Why aren’t there more apple trees in more parks? Provo is doing a great job incorporating edible plants into urban landscaping, but apparently Todmorden, England, is doing even better. In the TED talk below — which is quite entertaining, by the way — Pam Warhurst discusses how her city has planted fruits and vegetables in just about every place possible: roadsides, police stations, and even the cemetery. More specifically, Warhurst argues that food appears to be a common language that cuts across cultures. She also points out that she and others just went out and changed the community, without funding or permission. It’s an inspiring story and this post from Polis provides a more detailed rundown on Warhurst’s argument. More than 1,500 miles south, I was recently fortunate to witness a different but similarly powerful example of edible landscaping. 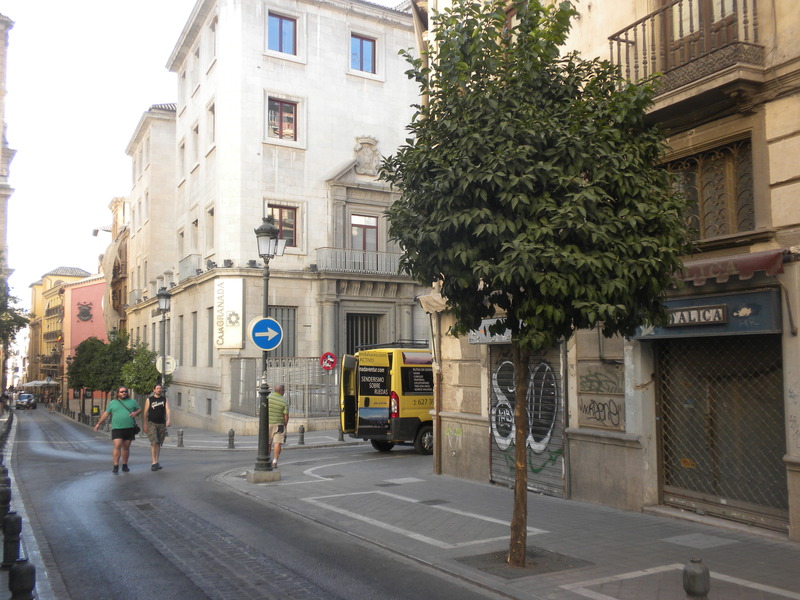 In numerous towns around Spain, the streets are lined with orange trees. It’s a tradition that has existed for hundreds of years, and I’m told that when the trees are in bloom entire neighborhoods are filled with the aroma of orange blossoms. Orange trees also are popular because in Spain’s climate, they don’t lose their leaves and thus provide year-round shade. 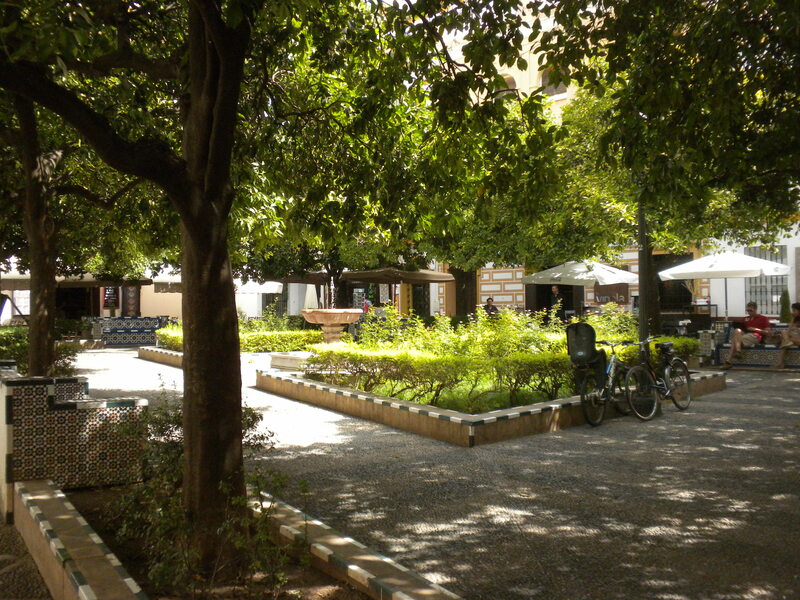 Orange trees shading a public square in Seville, Spain. Orange trees line the street in front of a Baroque church. Orange trees on a fairly average street in Granada, Spain. As is apparent, the orange trees pictured above are not massive. In fact, they’re pruned to produce fruit — unlike many urban fruit trees in the U.S. that are pruned to reduce yields — and are replaced when they get too old. Though every spot in these pictures may not have always had orange trees, the general tradition is very old. The oranges from these trees are not particularly edible. (I’ve heard that tourists like to try them anyway, though I did not.) But they are productive, yielding material for British-style orange marmalade, perfume, and many other things. In other words, these trees do produce a usable crop. These trees, as well as Warhurst’s examples from Todmorden, show the power that urban agriculture can have as well as an obvious next step for a city like Provo. The understanding and appreciation of this idea already clearly exists in Provo, all that lacks is a little more effort to make our existing landscapes a little more edible. It’s hot outside and everyday when I call fire officials — I cover wildfires among other things for work — they tell me it’s going to stay hot. And while the record breaking heat can be a pain, it also emphasizes the massive benefit of city trees. As I have mentioned in previous posts, city trees significantly cut down on energy and irrigation costs. They also cut down on crime and offer free food. The master plan reports the city has more than 2.5 million trees that sequester 13,900 tons of carbon dioxide a year, saved residents $3 million in energy bills last year and remove 519 tons of pollution at a savings of $3.6 million a year. Street trees alone diverted 41.8 million gallons of stormwater last year. The plan calls for a 20 percent increase in the size of Pittsburgh’s tree canopy over the next 20 years. That’s no small task considering the city already has 2.5 million trees. Interestingly, the article notes that many of Pittsburgh’s trees are located in more affluent neighborhoods. Though Provo is much smaller than Pittsburgh, I’d argue that something similar is true across Utah and Salt Lake Counties. That suggests that richer people can afford to plant and tend trees, but it may also indicate that trees are a way to increase individual and neighborhood-wide property values. Unfortunately, trees in northern Utah will almost certainly need more irrigation than trees in Pittsburgh. Lately, I’ve also seen quite a few young trees that have died from apparent lack of water. But in many cases property owners are irrigating anyway to maintain lawns. And in any case, the benefits trees have on cities are so significant that, like Pittsburgh, Provo also could benefit from an overt effort to increase it’s urban canopy. Some parts of Provo are filled with trees, but like Pittsburgh, Provo could use an overall increase in it’s urban canopy.